Spin the Bottle—with Your Dog! Does your dog have the winter blues? Training games are a great way to keep your dog’s brain busy when boredom sets in. Playing games together will strengthen your bond, too! Adapted from the popular book Gamify Your Dog Training by Terry Ryan, the following “Do It Yourself” craft game emphasizes targeting behavior and cue discrimination. Discard the bottle top, the label, and the plastic ring around the bottle mouth. Punch corresponding holes on either side of the bottle. Slip a wooden dowel through the holes. The dowel should be long enough to provide a comfortable handle on both sides. Try it out. Does the bottle spin if you hit it? If not, the holes may need to be enlarged. Seated, hold the bottle by the two handles in front of the dog at nose level. Let the dog watch you drop dry food into the top of the bottle. 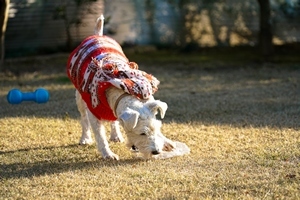 Encourage the dog to experiment with getting the food out by himself. Some dogs use their noses, while others use their feet to spin the bottle. You might reinforce only using the paw or only using the nose! Note: This is a cooperative toy. Never leave your dog unattended with the bottle. He might tear it up and hurt himself on the sharp plastic or sticks. Find more training games like these in Gamify Your Dog Training by Terry Ryan! Order Now!